Digi Electronics Lock Co., Ltd. Features: 1. Pure stainless steel mechanical structure with service life over 10 years. 2. Installation especially friendly to non-professionals. 3. Easy to change batteries. Just several minutes needed. 4. Free handle protects the door from being opened by force. 5. Fingerprint user capacity 75 and password capacity 78. 6. The users can be deleted individually without any impact on other users. 7. 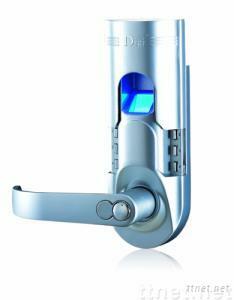 Passage Function: just pull up the slide cover to open the lock in this mode, convenient for frequent access.